The harrowing adventure-at-sea memoir recounting the heroic search-and-rescue mission for lost Montauk fisherman John Aldridge, which Daniel James Brown calls "A terrific read." I am floating in the middle of the night, and nobody in the world even knows I am missing. Nobody is looking for me. You can't get more alone than that. You can't be more lost. I've got too many people who love me. There's no way I'm dying like this. In the dead of night on July 24, 2013, John Aldridge was thrown off the back of the Anna Mary while his fishing partner, Anthony Sosinski, slept below. As desperate hours ticked by, Sosinski, the families, the local fishing community, and the U.S. Coast Guard in three states mobilized in an unprecedented search effort that culminated in a rare and exhilarating success. A tale of survival, perseverance, and community, A Speck in the Sea tells of one man's struggle to survive as friends and strangers work to bring him home. 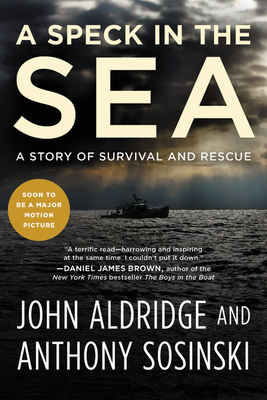 Aldridge's wrenching first-person account intertwines with the narrative of the massive, constantly evolving rescue operation designed to save him. John Aldridge and Anthony Sosinski co-own and operate the Anna Mary, a lobster boat, in the open ocean surrounding Montauk. Best friends for decades, Aldridge and Sosinski are seasoned sailors and fishermen. "A Speck in the Sea is a terrific read-harrowing and inspiring at the same time. In the end it's a moving testament both to our individual will to survive and to our collective will to come to the aid of others in distress. I couldn't put it down." "Sometimes being a hero means just hanging on and having faith--which is exactly what John Aldridge and Anthony Sosinski did on July 24, 2013. This is an amazing tale of survival, family, community, and friendship from two true American originals." "A robust portrait of working-class Montauk, the Long Island community... richly detailed." "This absolutely riveting book follows the increasingly desperate (and, at times, disorganized) rescue efforts as well as Aldridge's own odyssey (How does a man facing near-certain death keep himself believing he might survive?)... the book is... captivating." "A rich backstory-including complicated personal lives and deep family histories-adds depth to this page turner." "A Speck in the Sea is not just about a man lost in the Atlantic. It's an inspiring story of hope, strength, and the love people have for their community. In this tale of heroism and survival, readers will find pieces of themselves and the people they love as they see a family and community brought together."